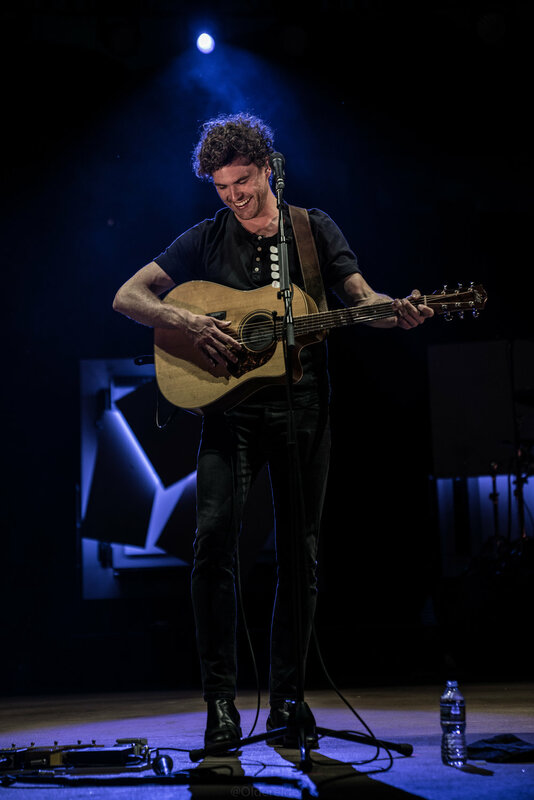 Vance Joy’s transcendent Nation of Two performance at Red Rocks Amphitheatre was not only a major accomplishment for the artist, but also a testament to his rapid success and newfound stardom. The world and all of its picturesque beauty seemed to stand still at as fans trekked up the curving staircases into the earth-red amphitheater. Without a cloud in the sky, the sea of fans’ smiling faces was luminous; seemingly with its own glow and heartbeat. People of all ages packed tightly into the risers; mothers and fathers with their young children, tween youth, and teenagers like myself amounted to over 9,000 people going to witness the doe-eyed singer. As people found their place amongst the others, Alice Merton’s clear, energetic voice came ringing off the stage. The entire crowd was dancing and clapping along to her band’s vivacious music. Even as an up-and-coming artist, she commanded the stage passionately in ultramarine pants and black Converse Allstars. She told a short anecdote before each song, thus creating a personable connection between herself and the audience. She concluded her set with “Why So Serious” which earned her a well-deserved standing ovation. The boundless smile on her face proved just how precious her music is to her, and how elated she was to be able to share it with us. People made conversation as they waited eagerly for Joy’s appearance. Five band members walked on and assumed their positions. Suddenly, the lights faded to black and fog filled the stage; the audience cheered wildly. The lights came up slowly. Large, geometric glass panels illuminating Joy’s tall silhouette -- his curly chocolate-brown hair and acoustic guitar showed clearly through the shadow. 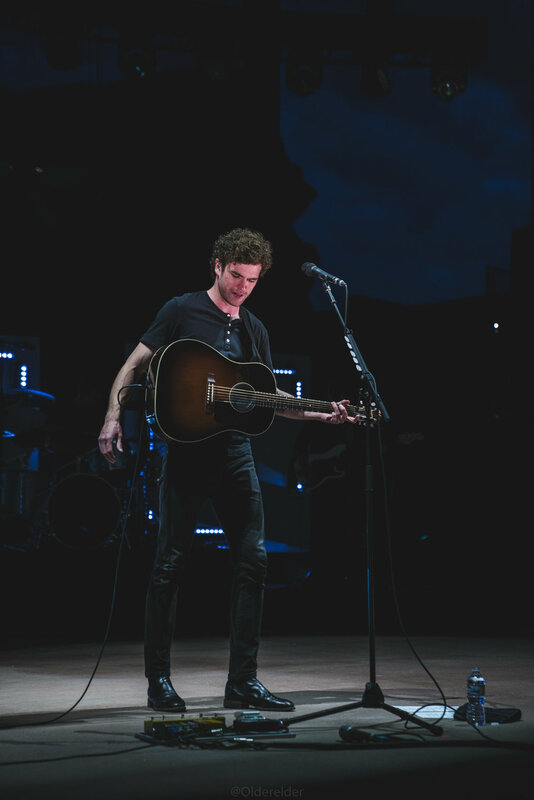 The sound of his guitar echoed throughout the amphitheater, and for a moment, everyone went completely silent. However, the air quickly broke as his sweet voice, singing “Mess is Mine”, serenaded the evening into night. His black-clad body shifted back and forth as his music carried everyone into the dreamy world of his music. In between each number, he told personal stories, fostering a familial atmosphere, and evoking a strong emotional context for each song. The lights faded to a deep orange as he transitioned from his opening number to “Like Gold”. From there, a light nod to American patriotism with a red, white, and blue light scheme as he sang “Take Your Time”. His biggest applause came after performing his succeeding song,“Fire and the Flood”, a hit off of his first album, Dream Your Life Away. He described how, for years, he had the lyric “everything is fine when your head’s restin’ next to mine” in his mind, and the breakthrough moment when he composed this song and the words fell perfectly into place. His crowd-connection heightened as, right before “I’m With You”, he paused and kindly asked the audience to shine their phone flashlights. All at once, the crowd was plunged into momentary darkness just before the twinkle of flashlights replaced the stage lights, once again bringing the stage into full view. The swaying lights gave a new life to the ballad, allowing the stars in the sky overhead to be complimented and shine even brighter as if moving to Joy’s music as well. Joy took a moment before his next number to tell a ‘long-story-short’ before performing “Little Boy”. When he was a child, he got into a biking accident that left him without one of his front teeth. He went to the hospital, and a cosmetic dentist fits him with a glow-in-the-dark ‘big tooth’, far too large for a little boys mouth. Joy smiled as he began singing, showing off his porcelain partner. The charmed audience laughed and sang along to every word of the song. After the lullaby-est vibe of the next few tunes, the audience was jolted back to life as lightning flashed in the sky in the distance just as Joy began to sing one of his biggest hits, “Riptide”. 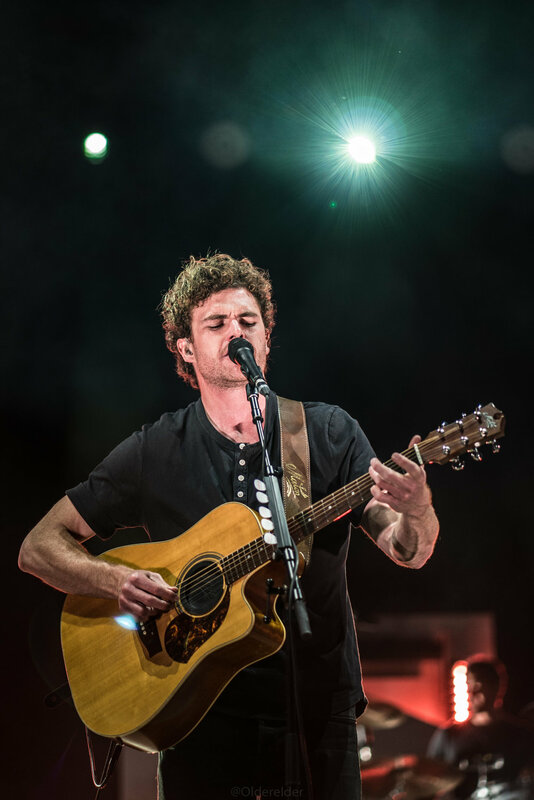 Joy concluded his extraordinary show on the rocks with the most well-known song off of his new album, “Saturday Sun”, leaving the crowd with an overwhelming feeling of bliss. 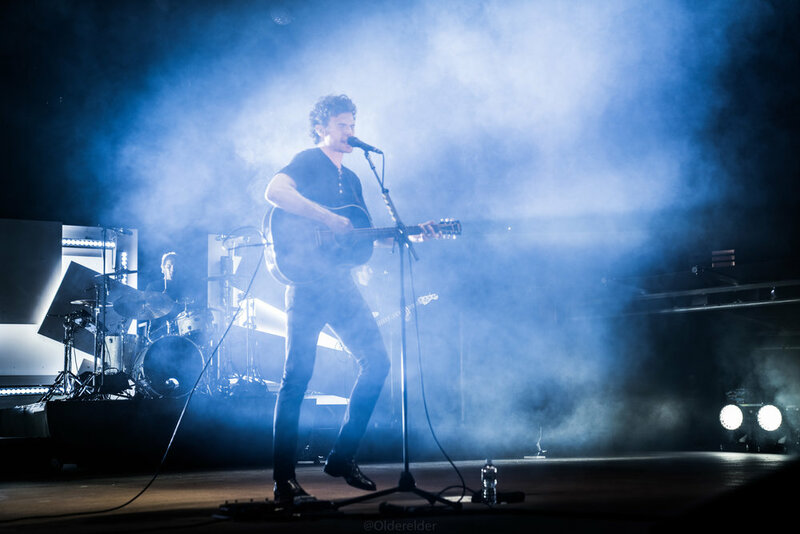 I had always been a fan of Vance Joy and his music, but seeing him in person was an experience I will never forget. It was obvious that he poured his heart and soul into every single song, contributing to my ever-expanding love for him and his music. His captivating sound and resounding stage-presence are enough to leave you feeling complete, but yearning for more. His performance was comparable to an audible antidepressant: a radiant sound telling you to never stop pushing and reminding you that when things become too much to bare, look up and notice that the universe is much bigger than any worldly problem.